Hillsboro American Legion Post 129’s Austin Brown winds up to throw a pitch on Wednesday at VA Memorial Stadium in Chillicothe where Post 129 took on Chillicothe Post 757 in the American Legion Baseball Region 5 tournament. 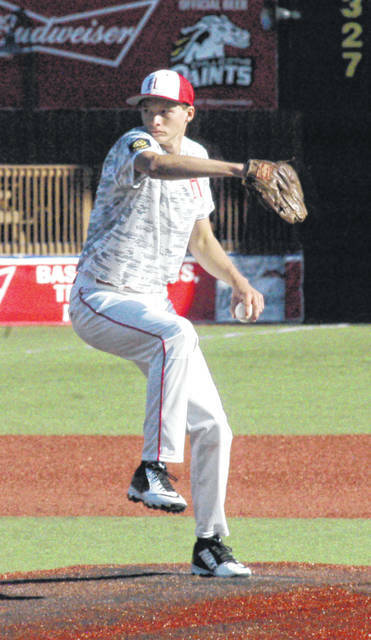 Hillsboro American Legion Post 129’s baseball team returned to the VA Memorial Stadium in Chillicothe on Wednesday to take on Chillicothe Post 757 in the American Legion Region Five tournament. Post 129 emerged from the game with a narrow 4-3 victory in seven innings. Post 129 registered an early lead as they scored a run in the top of the first inning as Kelton Anderson drove in Payton Bell. Hillsboro saw the first four batters of the inning reach base safely before the defense of Post 757 got their footing and prevented Post 129 from scoring again in the inning despite having the bases loaded. The bottom of the first inning through the bottom of the third inning was a showcase of pitching and defense for both teams as Post 129 starting pitcher Austin Brown and his counterpart for Post 757 held each at bay and sent the game into the fourth inning with Hillsboro leading 1-0. Gavin Taulbee opened the top of the fourth inning by drawing a walk and moved into scoring position on a sacrifice bunt by Justin Scott. Bell drove Taulbee in from second with a single to extend the Post 129 lead to 2-0. Following another scoreless inning for Chillicothe, Caleb West led off in the top of the fifth inning with a single and later stole second. West went on to score from third base on a double steal attempt that saw Mason Stanley cut down at second and inched the Post 129 lead to 3-0. In the bottom of the fifth Post 757 made their mark with two runs and kept the Hillsboro boys off the scoreboard in the top of the sixth inning. In the bottom of the sixth Chillicothe tied the game on a single by Tyler Rood that scored Caleb Foglesong from second and tied the game at three runs apiece. Post 129 broke the tie in the top of the seventh inning when Bell, who singled and advanced to second and third on sacrifices by Mitchell and West, was driven in on a single by Anderson. Anderson then took the mound in the bottom of the inning and retired all three batters he faced to secure the win for Post 129 and pick up the save. Post 129 head coach Scott Morgan complimented Brown on his performance on the mound despite giving up three runs late. “Brown had a good game on the mound, I know he doesn’t get the win for it but he should. He pitched a whale of a game and saved our bullpen for the most part,” said Morgan.